Today, I will be talking about nature inspired design, a little bit of a sharp contrast after yesterday’s feature on Dutch canal houses. However, I am not totally changing course, since today’s first pick also comes from the Netherlands. 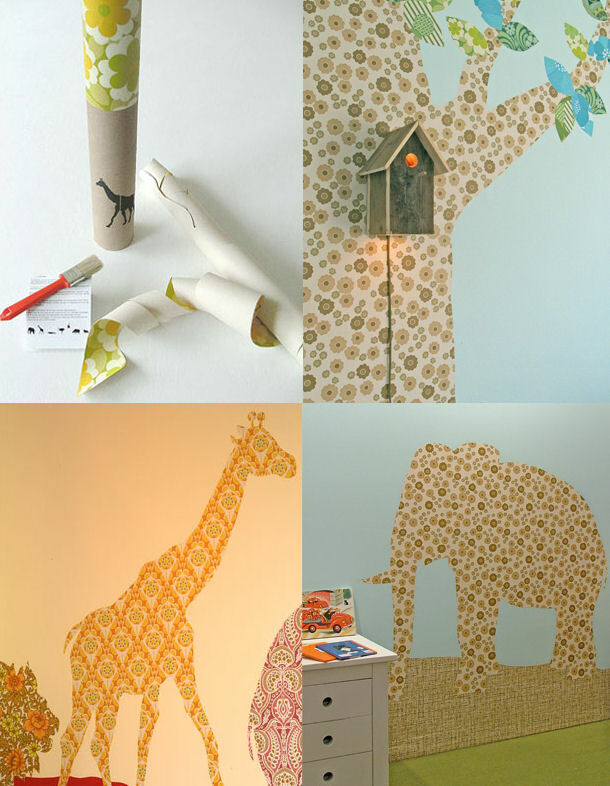 Who would have thought that not decorating a whole wall with wallpaper, but only using wallpaper silhouettes in the shape of animals or trees would be so much more appealing? The idea had never occured to me, until I was totally smitten with this ingenious idea when I first saw it a few months ago. Not only is this a great idea for those of us, who want to beef up the interior without being overwhelmed by too many textures and patterns, but it also gives a bit of retro charm, while still being cool and not too kitschy. Last but not least, Dutch designer Inke Heiland’s creations are simply beautiful, and you can choose among a huge variety of prints in all sorts of colors. Among her collection are gorgeous wildlife animals, such ans elephants, monkeys and ostriches, but also wall-high trees. Though let me warn you, all wallpapers used are original vintage items. While that makes them even more beautiful, stocks are limited and color ranges change constantly. So if you see a design you really like, don’t hesitate too long with ordering. Even if you don’t care for animals, there are also wallpaper chairs, lamps and plants available, for a more ‘grown-up’ appeal! Besides the wallpaper designs, Inke also offers a birdhouse lamp, a really awesome idea, and it looks simply stunning in combination with the tree wallpaper. And of course it perfectly complements today’s nature theme! Inke’s creations can be ordered on her website, but you can also buy them in several stores around the globe, if you prefer to see how the prints turn out for real, just check the retailer information on her site, also if you are searching for an online retailer closer to you. Trees € 195.00 each, lamp € 149.95, animals: 2 little birds € 16.40, all big animals between € 39.60 and € 58.50. Prices are for a complete kit including instructions, wallpaper paste and brush, so you can get started immediately. Today’s last architecture and city inspired picks are Mini Moderns blueprint designs Town Square and Do You Live In A Town. Several items are available to decorate the room of your budding architect, from wallpaper to pillows or tableware. I like the neutral design that can grow along with the child and is not too much limited to one age group or gender. Moreover, it will match well with other decorations, as it is not too bold or flashy. The quality is also exceptionally nice to note, as the wallpaper can be wiped clean and the bone china tableware and money boxes are even produced and hand decorated in the UK! Apart from the two town prints, they have many more beautiful designs available, so whether you are searching for boy or girl, funky or more simplistic, you will surely find something great. I think their Moo and Battery Square designs are truly beautiful, and the Tick Tock wallpaper is even designed to be colored by your kids. Though perhaps some parents have issues with their kids starting to paint on walls, and in that case it looks just as beautiful in plain black and white. But I have to admit, the photos of the colored-in Tick Tock paper do look pretty, as do all other products! Some price indications: floor cushion £40, including pad £50, wallpaper £38 per 52cmx10m roll, money box £18.00. Check their website for ordering and retailer information.